I had a chance to review the Outdoor Products Skyline 8.0 pack recently and I wanted to share a few quick thoughts. Two oversized side pockets hold water bottles, maps, etc. The Outdoor Products Skyline pack feels like a crossover pack: part school pack and part full-featured backpacking pack. 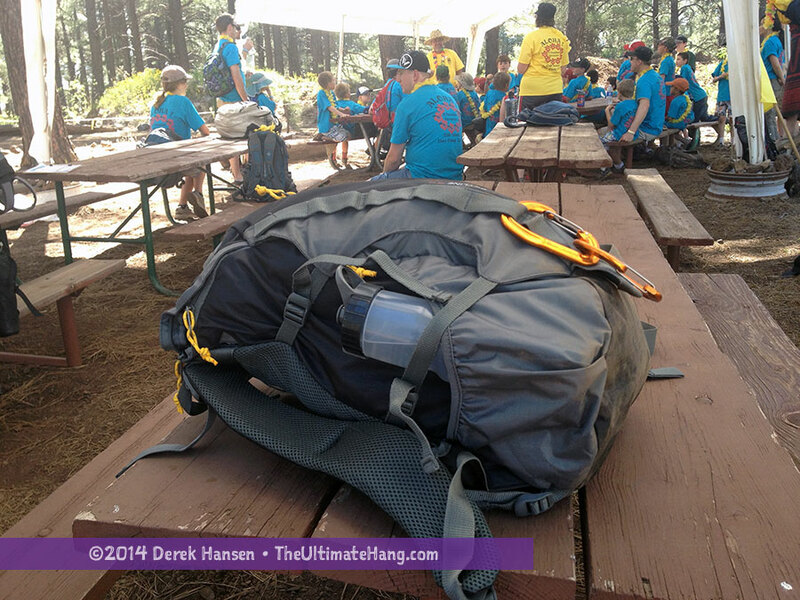 There are ample adjustment and compression straps and an internal frame that you would expect to see on a backpacking bag, but it carries more like a school day pack with a fixed torso length and a yoke that puts the pack lower down to the waist. When I first wore the pack, I first adjusted the shoulder straps to fit the pack comfortably, but then I noticed the hip belt was very high, snugging right up to my lower rib cage. I had to then re-adjust the shoulder straps and lower the pack so I could use the hip belt correctly. Wearing it this way (so low on my torso) makes it less comfortable for carrying heavy loads, but was fine for day trips. A dual line of daisy-chain webbing along the back of the pack and the shock cord “net” on the top of the pack provide some areas to lash or clip some extra gear. The construction and materials are robust and very durable (aka “bombproof”) with thick, strong webbing used for the straps and quality plastic hardware throughout. The back is padded and there is a single removable aluminum stay on the inside. There is a cool “hidden” zipper on the left side of the pack that runs by the outer pocket that provides access to the inner part of the pack. It’s easy to miss and somewhat curious to use — I’m not sure how useful this is on such a small pack since the contents are easily accessible from the top lid. I never really used it. There are two large side pockets that have ample room to hold 1L water bottles and other containers. The elastic gusseting helps hold the pockets closed somewhat. The zippered hip belt pockets are very roomy and are perfect for holding a Ziplock® bag full of trail mix, a flashlight, compass, or other mid-sized items. The pack lacks a floating lid, common on many internal frame backpacks, but does have a zippered compartment on the back. Inside the pack is a very roomy hydration sleeve and a latch. Ostensibly missing is a whistle lock on the sternum strap that I’ve come to expect on all modern packs. While not a huge loss, it is one more item that makes this pack more suitable for short day trips than backcountry jaunts. The compression straps make it nice to reduce the volume of the pack when I don’t have to carry as many items. 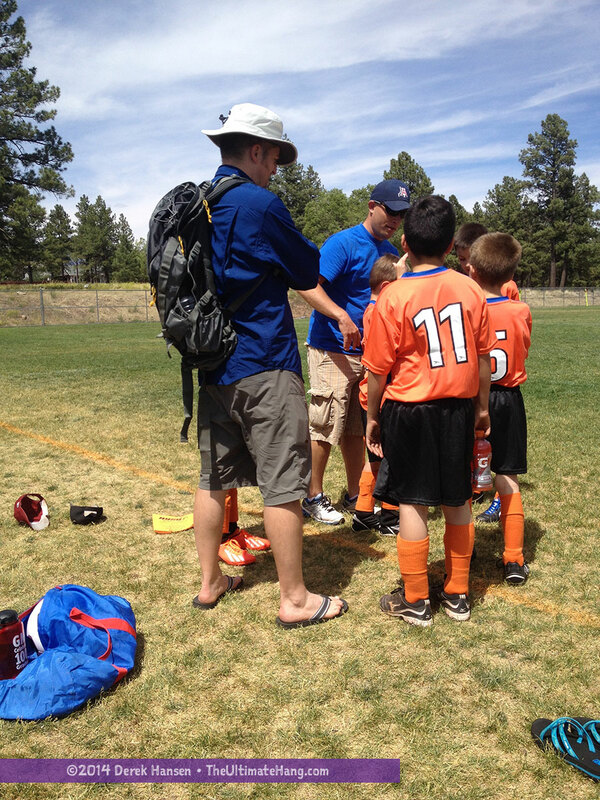 I’ve used this pack around town to carry various items for kids’ soccer games and family trips. I also wore it nearly all day during a Cub Scout Day Camp last week where I really got a feel for the load of the pack. Because of how the yoke is designed and how low I have to carry the pack on my torso (so the hip belt can be used), I found the comfortable weight load fairly low. I’ve taken low-volume packs like this out backpacking before, primarily in the summer when my weekend pack load is low and very light. This pack, however, doesn’t have quite the volume in the main pack body for all my gear, since some of the volume is taken up by the roomy side pockets and hip pockets. In addition, the pack is fairly heavy in relation to how much volume it offers, due to the rugged materials and extra webbing. It’s a great pack for throwing around on a day trip and I have no worries about tossing it in the trunk or on the field—something I don’t do with my lighter packs. I just purchased this today with a 3 liter CamelBak bladder to use with it. I intend to use for dirt biking, Mtn. Biking and hiking. It seems well made. I have a long day trip and may be doing some primitive camping with it. I paid about $55 for the combo at Big 5. Any comparable system would’ve cost me double or more. I too bought this from big 5 a couple of years ago and I am quite impressed with the durability and overall handiness. I’m a bicycle commuter and use it primarily for that plus day hikes. It holds a pretty good sized laptop even though the access is a bit narrow. I love the vertically zipped back pocket, where I store checkbooks, mail, etc., because I often forget to close it and even when tipped all kinds of different directions, nothing ever falls out. I keep a light rain jacket in one of the hip belt pockets. I’m short and have no issues with the hip-belt fit. The shock cording on the outside wore out this year, so I replaced it with p-cord. Now that its wearing out a bit, I see no reason to buy any other model to replace it. Holds lots of water too, with the hydration pocket plus the 2 side pockets.